On the surface, Rise of the Cybermen has a lot going for it: the Cybermen (obviously), an alternate Earth, the "return" of Rose's (Billie Piper) late father Pete Tyler (Shaun Dingwall) and lots of awesome special effects. Yet for some reason I didn't find this episode as exciting as I had anticipated. This is probably precisely because it takes place on a parallel Earth, so the events that transpire, though dramatic and shocking, don't really "count" in the way that they would in a story set on "our" Earth. That said, the Cybermen's 21st-century makeover, by writer Tom MacRae and production designer Edward Thomas, is very successful. The creatures' appearance has changed more radically than that of the Daleks in 2005, but then this is traditional for the Cybermen. The guys in the costumes are clearly no longer wearing flimsy, flexible cloth or rubber suits: instead their outfits have the appearance of real metal for the first time. Their catchphrases and methods of conversion are derived from modern phenomena such as mobile phones, iPods and software upgrades. As well as the old "You will be like us" line from The Tomb of the Cybermen, the cyborgs have a new chant - "Delete!" - to rival the Daleks' "Exterminate!" Their voices, provided by Paul Kasey and Nicholas Briggs, return to the 1960s style of modulation - though fortunately, unlike the '60s versions, it is always possible to tell what they are saying. Unfortunately, dialogue relating to the ubiquitous earpods is less clear. If you're not listening carefully, it sounds like people are talking about "earplugs" instead. And the visual gimmick of the earpods forming handles above people's heads when John Lumic (Roger Lloyd Pack) asserts control over them would surely arouse suspicion if this were to happen in a public place. I was also a bit surprised to see some misty Cyber-breath during the cold night-time scenes, but then it has been said before that gold dust can effectively suffocate Cybermen, so it follows that they must need to breathe sometimes. Rise of the Cybermen is OK, but the next episode rises to the occasion rather better. 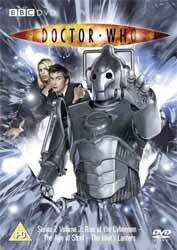 In The Age of Steel, the continuation of Tom MacRae's two-part Cyber-story, the Cybermen go all Borg on us. Graeme Harper (the first director to helm stories in both the old and new versions of Doctor Who: he directed the classic The Caves of Androzani and Revelation of the Daleks) generates palpable terror as the Doctor and Mrs Moore (Helen Griffin) have to walk past ranks of inert Cybermen. These scenes are markedly similar to several such instances in the Borg episodes of Star Trek: The Next Generation and Star Trek: Voyager. Rose and Pete infiltrating the Cyber-factory and coming face to face with what has become of Jackie is also reminiscent of TNG's The Best of Both Worlds. As with the Borg, there's also some genuine sympathy for the converted individuals as several Cybermen are released from mental control and recover their memories and emotions. I was also genuinely surprised by the plot developments surrounding Mickey (Noel Clarke). Throughout this two-parter, Roger Lloyd Pack dominates his scenes as the slightly Davros-like wheelchair-bound Cyber-creator Lumic. I wonder whether he ever repeated his famous Only Fools and Horses catchphrase, "Alright Dave", when he greeted David Tennant on set? On the downside, like the threats faced in the previous episodes New Earth and Tooth and Claw, the Cyber-menace seems to be defeated rather quickly. In other respects, though, this is an excellent example of the upgraded series. The Idiot's Lantern is my favourite episode of Series 2 to date (bear in mind that I haven't seen Doomsday at the time of writing). Writer Mark Gatiss (who gave us the previous season's The Unquiet Dead) has filled his narrative with lots of lovely little touches. These include the name of the street where most of action takes place. Florizel Street was the working title of the soap opera Coronation Street (until a tea lady pointed out to creator Tony Warren that Florizel sounded like the name of a disinfectant). Coronation... street... geddit? In another scene, the Doctor tells two policemen that you can't make your fingers meet around your elbow. Look carefully and you'll see the copper in the background trying to do exactly that! David Tennant gives one of his strongest - certainly his most forceful - performances as the Doctor. Witness his confrontation with Mr Connolly (Jamie Foreman): "I'm not listening!" And his vow to avenge Rose: "They took her face and left her in the street. And as a result, that makes things simple. Very, very simple. You know why? ... Because now, Detective Inspector Bishop, there is no power on this Earth that can stop me!" The rest of the cast is uniformly good, but Maureen Lipman is particularly noteworthy in a creepy turn as the Wire. Her victims are also quite unnerving in a Sapphire & Steel kind of way. When I was compiling my feature on possible "half-time" cliffhangers, this episode proved to be an absolute gem. The scene that ends 21 minutes and 42 seconds into the episode is so dramatic that it's hard to believe this story wasn't originally written as two 25-minute instalments with this as the cliffhanger. This is the exact opposite of the situation I faced a year earlier when I had great difficulty finding a suitable half-time break in Gatiss's The Unquiet Dead. The climactic pylon sequence is perhaps a little over-long, but otherwise this is the perfect excuse to stay glued to your goggle box.